Kenya hosts a large array of national parks and reserves, both terrestrial and marine. Some of them, the ones most popular with safaris, are well developed and maintained, whereas others, the most remote and inaccessible, are hardly more than a spot in the map where plentiful wildlife has been reported. If you travel on your own, you should know that not all parks and reserves are managed by the same governing body. All areas gazetted as national parks are managed by the Government's Kenya Wildlife Service (KWS), whose main headquarters are located at the main gate of Nairobi National Park. Conversely, most (but not all) national reserves are managed by local authorities, mainly county councils. 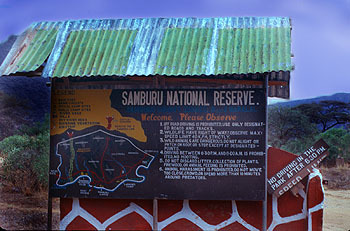 Examples of the latter are Masai Mara National Reserve and the complex Samburu-Buffalo Springs-Shaba National Reserves. This difference means that all information provided by KWS only pertains to parks and reserves under their governance. This is specially important since some parks managed by KWS cannot be accessed just paying the entry fee in cash at the gate. In this cases you will need to carry an electronic debit card called Safari Card. You will find more information about this system here. Never harass the animals. Do not make loud noises, flash lights at them or try to gain their attention in any other way. This is not only for the animals' welfare, but also for your safety and your chances of taking good pictures. Your vehicle serves as a blind or hide, since animals don't know you are inside. As long as you remain inside the car, you are safe. Only elephants can be aggressive at certain places where poaching is widespread, like Tsavo, or where they are not used to seeing vehicles. If an angry elephant gets on your way, just push the accelerator in neutral gear. The noise will scare it off. In any other case, always give way to animals. Keep on the well-marked roads and tracks. Do not leave the roads to chase the animals. Off-road driving spreads exhaust fumes and oil, destroys the grass layer and erodes the ground, disrupting the soil drainage patterns. Also, do not drive through closed areas. There is a reason to close them, whether it is obstacles on the road, flooding, falling rocks, or a film crew working. Do not feed the animals. Even if they seem to like your food, it can be harmful for them. Apart from this, wild animals that receive food from humans usually become aggressive. Just think about the baboons you may have seen in drive-thru safari parks in Europe or America, where these animals behave like mobsters. You will notice that baboons in Kenya will never interact with you except in places where people feed them, like the Baboon Cliff Lookout in Lake Nakuru National Park. Do not throw away trash or cigarette butts. Littering increases fire risk and is harmful for animals that may eat your trash. Even your food discards may be harmful for the environment. Needless to say, never light fire except where permitted. Show respect to other visitors. Although this is not a written rule, there is a right of view for the first spotter. That is, if you stop by some other vehicle and you see that they have found some interesting animals, please do not get in their way and do not obstruct their view of the animals. If there is no room for your car, simply wait patiently for your turn. Drive at reduced speed. The speed limit is usually 40 km/h. Fast driving deteriorates the road surface, increases the noise and puts animals in risk of being run over. For your own safety, stay in your vehicle at all times. In all parks that must be visited by car it is forbidden to leave the vehicle except in designated places, such as picnic sites or walking trails. Some parks are closed to traffic and must be travelled on foot. Wild animals are dangerous. Despite their beauty and harmless appearance, bear in mind that wild animals are unpredictable. Most cases of incidents with wildlife are usually due to negligence. It is mandatory to enter and exit the parks through the designated gates. Otherwise you will be violating the parks' regulation and driving off-road. Stick to the hours of traffic allowance. Within national parks and reserves it is forbidden to drive from dusk to dawn (usually from 7 p.m. to 6 a.m.). During the night you are requested to stay at your lodge or campsite. If you wish to do some night game drives, it is possible to do so off the park limits, like in private or community ranches adjacent to parks or around lodges located outside the parks. Be sure to carry your park tickets (and Safari Card where applies) with you at all times. During your game drives you might be stopped by rangers for a routine check. Do not take, seize or purchase any organism or parts of it, alive or dead. It is an offence and is heavily fined. Curio shops or dukas do not sell any items manufactured with animal materials, but you might be approached by Maasais trying to sell you an ostrich egg, or someone at a petrol station may show you some lion claws. Never buy such things. Pets are forbidden in parks and reserves. They could attract predators and can communicate diseases to wild animals. In marine parks, stick to the same rules. Do not take or harm coral, shells, starfish or any other species. Also, do not purchase any shells or other products made from living things, since such trade promotes looting in reefs and beaches. Do not throw litter. Sea turtles can take plastic bags for jellyfish and will die if they swallow them. Do not feed the fish, some species can be dangerous and this also disrupts their feeding patterns. Line and bait fishing is allowed in reserves, but not in the parks. Harpoons are forbidden in all cases. If you travel with children, keep in mind that only children over 7 are allowed in mountain lodges like Treetops and The Ark. Some safari companies have special tours for families with children.